Skydiving is a prominent thing to do on most people’s bucket lists. It frequents itself at the top of the list so often that some say skydiving has lost its perennially #1 ranking as the world’s biggest rush. So why not step it up a notch, Nerve Rush style. Skydive on every continent! With a drop-zone located only a few miles away from the Pacific Ocean sky-dive Santa Barbara offers up breath-taking panoramic views of the California coast line. This drop zone isn’t just a create spot for first timers. For those that have jumped before but are looking to add a little extra thrill to the experience, Santa Barbara offers up the highest tandem skydive in North America. 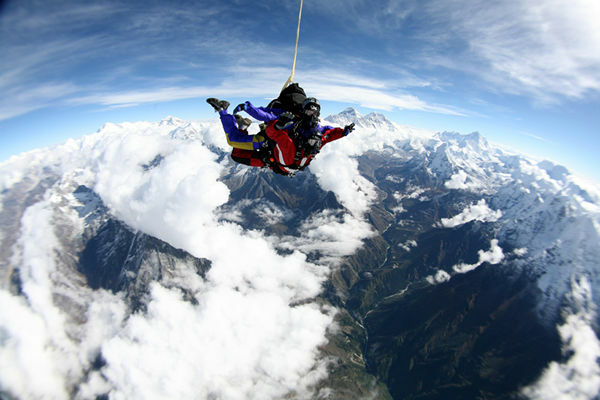 An 18,000 ft jump with over a minute and a half of free-fall time is sure to give a fix to any adrenaline junkie. Aside from its chocolate, banks, and watches, Interlaken, Switzerland houses one of the most extraordinary drop zones in the world. At the base of the Swiss Alps and nestled between Lake Thun and Lake Brienz you will have the option of jumping from an airplane or helicopter. Scenic views of mountain tops and glaciers offer a unique look as your shoot opens. If skydiving wasn’t enough to tickle your fancy, Interlaken also gives you the opportunity to test your nerves through hang-gliding, Alpin rafting, and paragliding. From bungee jumping, to elephant back riding, and now skydiving. 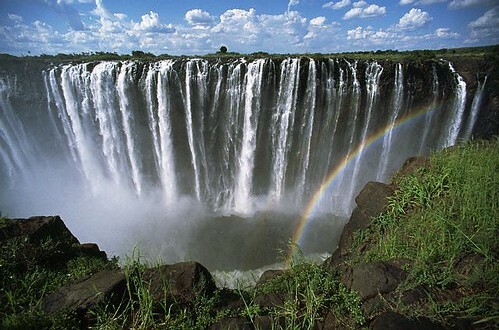 Victoria Falls in South Africa, located on the Zambezi river between Zambia and Zimbabwe, gives those with a few screws loose a chance to see one of the worlds largest and most beautiful waterfalls from a unique perspective. A 25-minute scenic flight with Skydive Vic Falls gives you a chance to see the falls up close as well as many other local landmarks. The indigenous name for the Falls is “Mosi-oa-Tunya” – which translates to “The Smoke that Thunders.” If that doesn’t scare the crap out of you, I don’t know what will. Well on its way to becoming one of the worlds best skydiving resorts on the planet, Skydive Dubai offers thrill-seekers a chance to fly over a man-made peninsula that is literally on the water and even has its own private beach. After taking in the views that include the World archipelago, the 7-star Burj Al Arab hotel and the Burj Khalifa – the tallest building in the world – you can take a dip in the Arabian sea or enjoy the world-renowned night life. If that is not enough, hop on a quad and rip in up in the desert. Deemed the adventure capital of the world, Queenstown is located on the south island. Between Queenstown and Rotorua, a 2nd location on the north island, 180,000 people have tumbled out of planes since 1990. 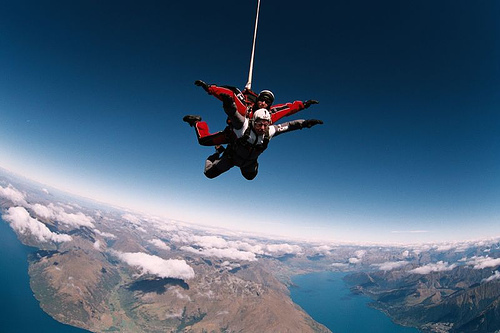 The first commercial skydiving operation in New Zealand gives you the chance to leap from up above the Remarkable’s mountain range (how fitting is that). The Rotorua location is found between two towering volcanoes and is surrounded by mud pools, active geysers, and steaming lakes. The sky above this drop zone is known as Ranginui, or the Maori Sky God. Perfect blue skies and wonderful weather make Sao Paulo a pristine drop zone. Located near the Atlantic ocean just outside of Rio De Janeiro, this jump offers up one of the most beautiful skylines in the world. 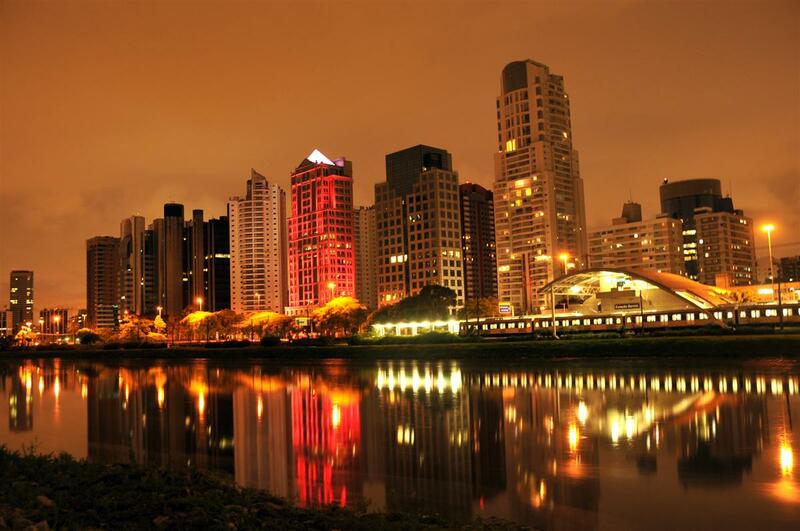 If you time it right, you might be able to get a jump in as well as catch Formula 1 race, attend the ATP Brasil Open, or an Indy 300 event. The 2011 Skydiving world championships were held here..so you know it’s legit. This is not for the noob. Valery Rozov was the first man to climb the nearly 10,000 ft Mountain, Ulvetanna and base jump off of it. The free fall lasted roughly 45 seconds through -30 degree Fahrenheit winds. Although you might not be able to experience what Valery did there is a chance to get close. *Bonus 1: Skydive Mount Everest in Nepal. Falling from 29,500 ft in the air will give you plenty of time to pull your shoot. You’ll also be able to land on the highest drop zone in the world at 12,350ft. The Everest jump team only conducts four jumps over the course of a year. You’ll need to throw down a few clams as well to prove your serious. About $25,000 worth! Word on the street is that you get a pinky ring and diamond studded wing suit, John Travolta style. Reserving your spot needs to be done six months prior to the jump date. If you’re looking to put some hair on your chest, this may be your best shot. For a jump that is seriously out-of-this-world, check out Felix Baumgartner and team Red Bull starts. These fools plan to jump from a stratospheric balloon 120,000 ft above the earth. Felix will be testing the limits as gravity yanks him back into our atmosphere at supersonic speeds. This jump will exceed the current world record held by Joe Kittinger in 1960 by nearly 18,000 ft.
I’m not sure how long the free fall will be..due to the weight of this guys balls. If you decide to put this on for bucket list better save it for last. “I’m not sure how long the free fall will be..due to the weight of this guys balls.” – Probably one of the best lines I’ve read in some time. Still cannot stop giggling!! I think it’s safe to say we can avoid the social proof and just assume its true. That last one looks absolutely mental. I quite like the look of the Dubai one, but I think I’d be too scared to jump out an actual plane. Not because of the jump. Just in case the shoot doesn’t open.